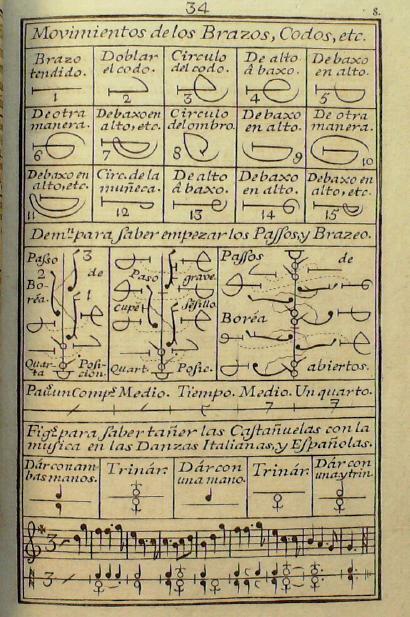 Minguet [this link requires a Harvard password], a writer and publisher in Madrid, was one of the first to assemble dance treatises and notation from various sources and make them available in Spain. 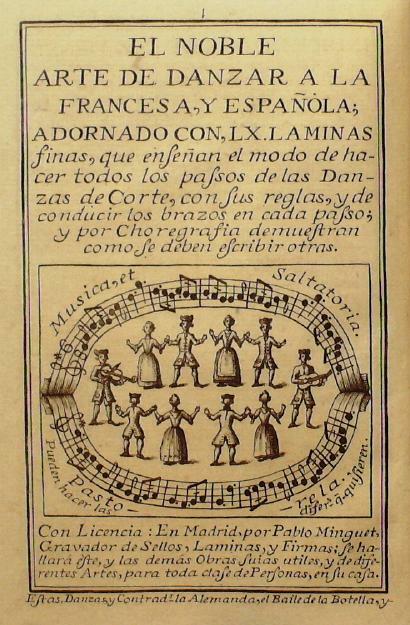 This particular imprint provides several French dances in standard Feuillet notation, as well as several French and Spanish dances in a simplified form of the notation. In the two images above, we see the complex symbols used to denote the footwork, as well as positions for the elbows and arms. 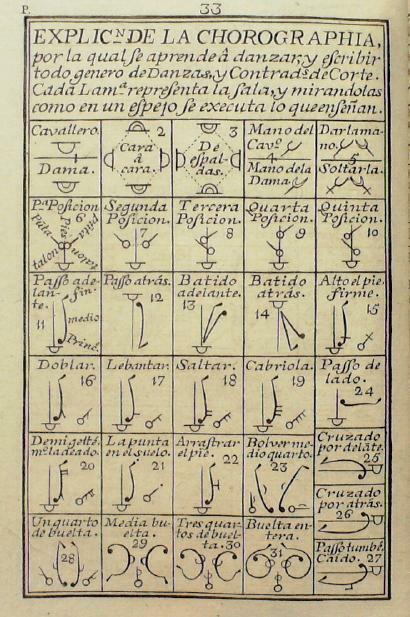 As I understand it, in standard Feuillet notation it is assumed that the footwork makes evident the positions of the arms and hands, so they are rarely notated. Feuillet notation is generally presented in reference to a line of music, under which one can see the symbols for footwork as it would be seen from above the dancer’s head, looking down. 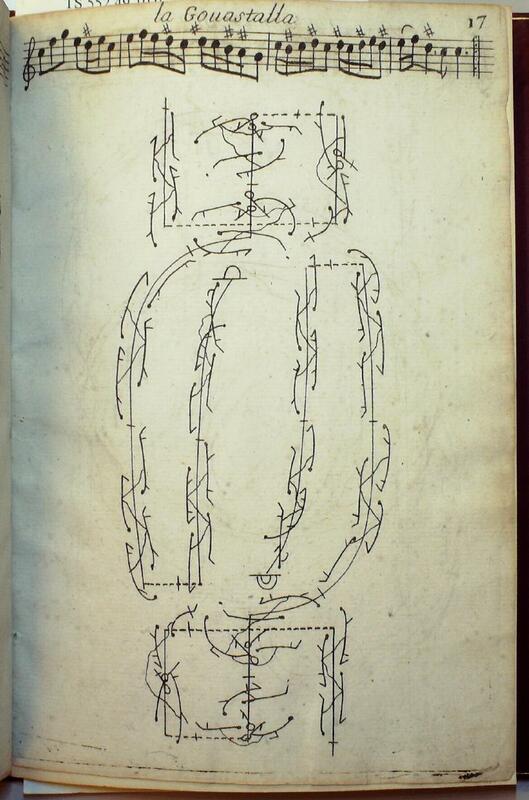 In this example of the original French Goustalla, from the Eighth recueil de danses noted by Feuillet himself and published in 1709, the dance notation for the man and the woman are each crossed by short slashes, which indicate where each measure of music begins. 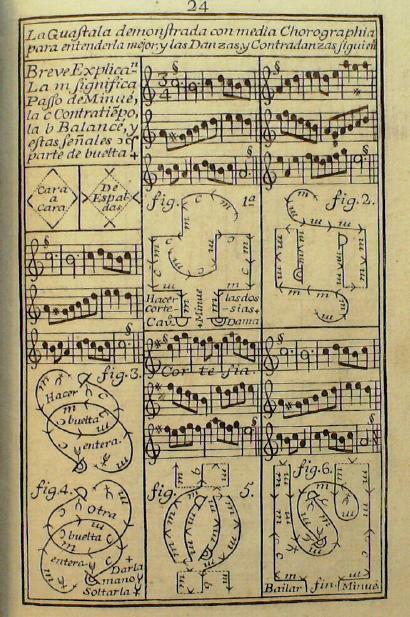 At first the notation appears to be a fantastical Picasso sketch, but once each measure of music can be separated out, and the symbols then related to the key seen above, it all begins to make sense. 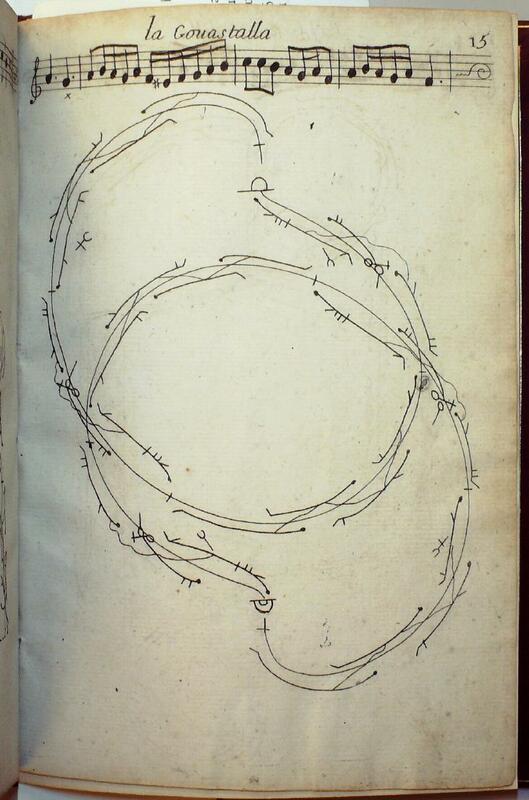 The same dance, in Minguet’s version named the Guastala, is presented in a simplified version. 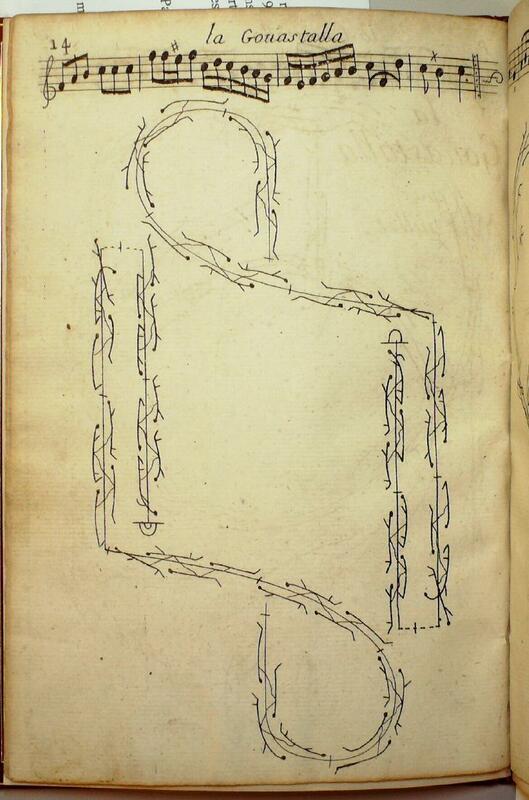 The French version above is actually notated across several pages, which are reduced here to the one page (I’ll present the rest of the French version below for comparison). The choreography isn’t quite the same. 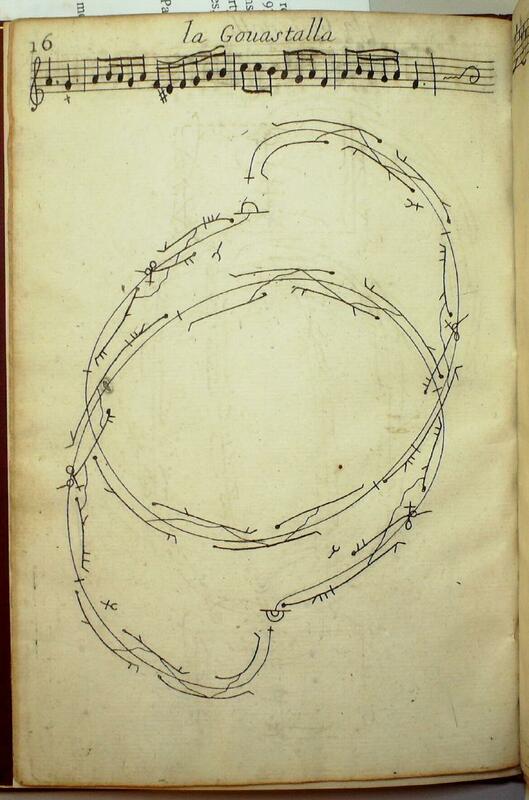 What a splendid opportunity for dance historians to compare how a dance traveled, and was absorbed by the Spanish! I simply chose the first dance for which I found earlier French notation, but there are at least eight dances here which can be compared to their original French versions. And the Spanish dances present a tempting opportunity to see if and how Spain interpreted the dance styles emanating from the French court. 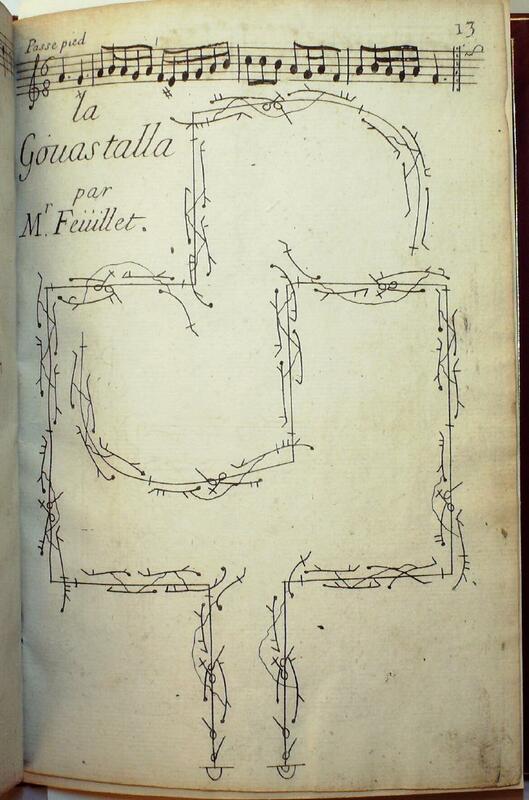 The remainder of the French version of the Goustalla shows the full standard notation for the original dance. 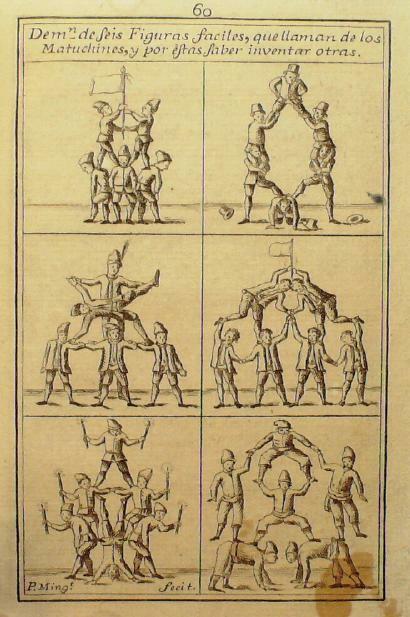 And after studying and comparing all of this “noble” dance, Minguet provides us with a quick circus break, to enjoy some human pyramids. Something for everyone. 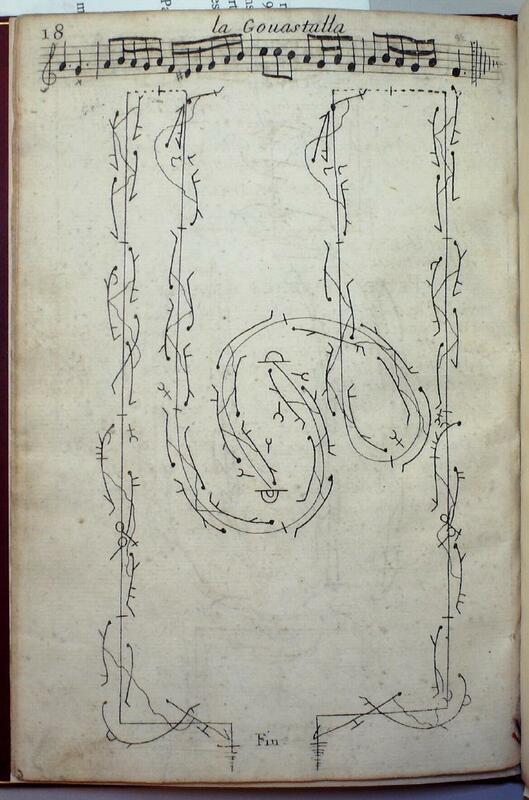 What a wonderful post on a superb publication! I especially enjoyed the pyramids, which look just like the ones my cousins and I used to make.